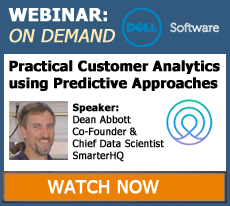 This webinar will describe predictive analytic approaches to common customer analytics task such as predicting likelihood to purchase or expected near-term customer value. Predictive approaches include considerable data cleaning and preparation, building predictive models, and assessing the predictive models. At each stage of the process, practical tips for accomplishing these tasks will be described with specific “how to’s” using Dell Statistica. We will also discuss compromises that inevitably need to be made because of data problems and time pressures to deploy solutions to operational systems. 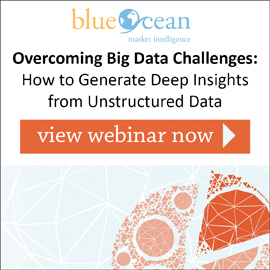 blueocean market intelligence’s Senior Vice President Durjoy Patranabish will discuss the most common Big Data challenges faced by leading organizations and how professionals can turn imperfect, complex and often unstructured data into actionable information. 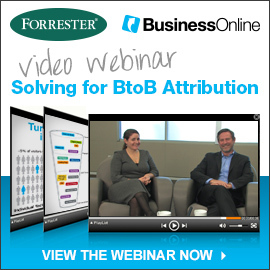 Forrester Research Analyst Tina Moffett and BusinessOnline VP of Analytics Rob Cataford discuss the challenges faced by BtoB businesses with long lead cycles and the importance of Marketing Attribution.